This last weekend I had the pleasure of participating in Sacramento's 2nd Sat. Art Walk. It was a great time with many local supporters coming out and enjoying the art, music, and food. While people streamed in and out of my studio I had the pleasure of walking them through my process. Many artist work differently. Just as a chef has his recipes and order of mixing food to make his own unique creation, artist too, have techniques and different ways to approach the canvas. Generally I start with a line drawing of my subject on the canvas with oil paint. 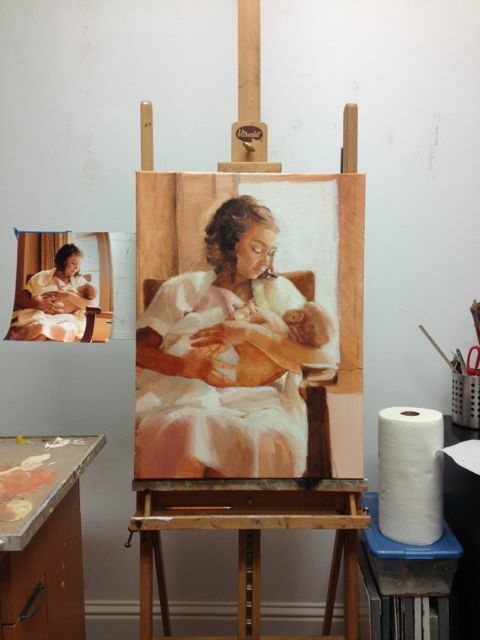 Using a small brush and neutral color paint, I draw the major shapes and observations of the image I am using. This also applies if I am painting from life. Next, I block in the value pattern. After I have the main shapes blocked in, I move around the painting, adding layers and slowly build the details. This process can go on for a long time. Towards the end I slow down and really take time to contemplate the piece. There might only be one or two final strokes, but the placement is crucial to the piece.